The Dallas Rock ‘n Roll Half Marathon seemed like the perfect race for me. I love running and I love rock ‘n roll! It is at the end of March, so the timing was perfect for my 2012 goal of running at least one race a month. My regular running partner didn’t want to run this one and I knew I couldn’t let someone’s else’s choices affect my goals, so I decided to run it alone. The only problem? 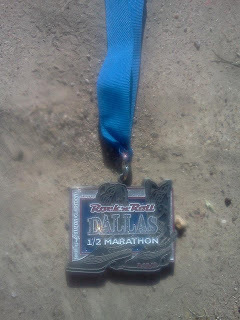 The race was at Fair Park in Dallas and I have an aversion to big crowds, people, traffic and driving to Dallas. So, what is a girl to do? Send out a random Facebook plea, of course. I posted that I was looking for someone on the Fort Worth side of town running the race that would be willing to take me along for the ride! I knew that I had a couple of runner friends in my Facebook friend list, but wasn’t sure who, if anyone, was planning on running this one. Right away I got a bite. My FB friend Natalie, who I met a couple times at parties, whose hubby is friends with my hubby, was planning on doing the run too and was generous enough to offer up a ride. We made plans to meet at her house at 6am on that Sunday morning. The traffic was heavy as we attempted to exit from the highway to Fair Park in Dallas, but what do you expect when 14,000 people are all trying to get to the same place at the same time? By the time we parked our car, I was five cups of coffee (I got up at 5am on a Sunday, don’t judge) and two water bottles deep and I had to pee…bad. We decided to wait in the long porta-potty lines before we jumped on the shuttles that would take us to the start line. There were about 8 potties, that I think were all out of toilet paper, and were dropping off one by one as “unusable” as we approached the front of the line. People would exit the plastic blue doors and announce things like, “Well, that one is done” or “It's full”. Every once in a while a brave soul further back in the line would notice that there were certain available potties that were not being used and they would jump the line to brave it, mostly to regret their decision and sink back into their original place in line. It seems inherently wrong to have to wait in a long line of people to do something so disgusting. It is just one of those things that you have to get over. It was either this or peeing your pants along the course. Being a runner can be gross. Me and Natalie in the porta potty line. Ah, the memories. We quickly jumped on a shuttle with no wait that brought us to the starting line just a few minutes before 8am. We fought through the crowds and jumped (not literally) the barrier to find a place to line up on the street with the other runners. I couldn’t remember what wave I was supposed to start in, so we just found the only open place where we could squeeze in. 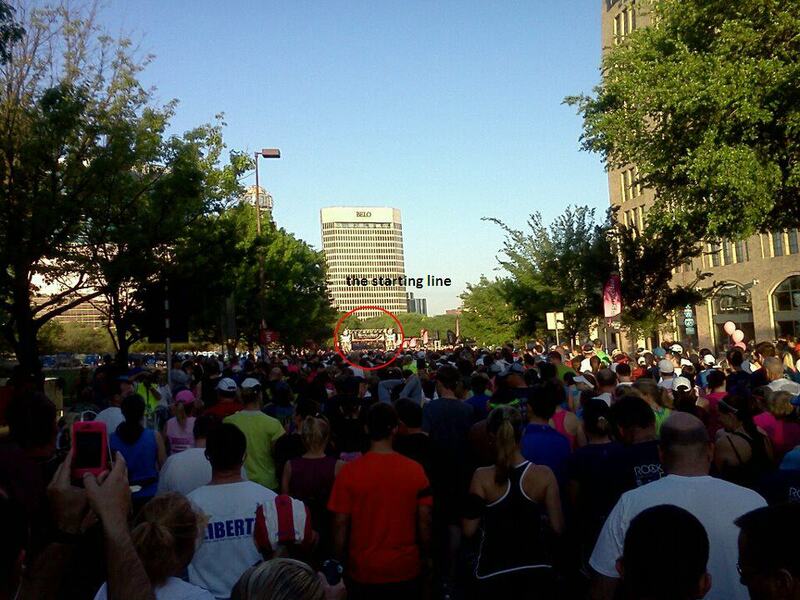 My original plan was to find a pacer who would finish in under 2 hours and to stay close to him/her for the duration of the course, but with these crowds, so close to the start time of the race, it would have been next to impossible to pick out the pacer. I noticed once I was settled in my spot, that I was standing near the 2:15 pacer, so I knew I ended up further back than my assigned wave, but none of that really matters. One by one, the waves started as we inched our way to the start line. It was probably 8:15 before our wave started. Natalie and I exchanged good lucks and I was off! I started off slow, trying to make my way through the heavy crowds at the start. As I ran the first part of the race through the streets of Dallas, I couldn’t help but compare it to my last half marathon in Huntington beach. HB had the ocean view, Dallas had the construction and the city streets! 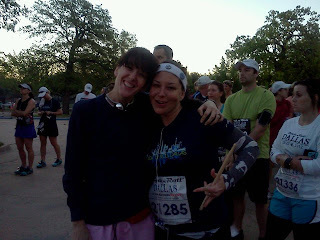 I was trying to imagine the ocean and I ran through the urban (read: not pretty) surroundings at the start of the race. However, I quickly made it through the downtown streets and we ran through some of the loveliest upscale neighborhoods of Dallas. The weather was perfect at the start. It was cool and breezy. I was properly rested and fueled so my body was ready for this, but I’m not sure my mind was just yet. I was kind of surprised when I hit the 5K mark so quickly and I couldn’t help but think, if I was just running a 5K today, I would be done already! As my mind was secretly wishing I only was running a 5K, my legs kept moving beneath me. I could tell right from the start it was going to be a mentally challenging race. I was already fighting my thoughts at the 5K mark and I still had a long way to go! One thing I noticed as I was running my fifth half marathon, is that I am learning how to control the adrenaline. In my first few races, I would feed off the adrenaline and use that to go as fast as I could, which is a fairly successful plan for the first ¾ of a long race. The problem with running faster than you train, is that your body shuts down at the end and you practically limp across the finish line in complete misery. This time, I focused on going comfortable pace. If I caught myself speeding up (even if it felt good), I forced myself back down to a comfortable, sustainable pace. At quick Garmin check’s throughout the race, I found myself running anywhere between a 8:50-9:30 pace. If I would catch myself in the 8s, I slowed enough to bring myself back into the low nines. After all, a 2 hour half marathon is a 9:10 pace, I didn’t need to go much faster than that to reach my goal of a sub two hour half marathon. When I say, sub two hour, I truly mean a 1:59:59 would be acceptable. Speaking of hills, the course description clearly stated that it was a flat easy course. I don’t know who writes these things, but this was not a flat course. There were hills and inclines for most of the first half of the race. Maybe if you are driving East on Mockingbird Lane from 75 towards Greenville Ave, if may seem like a flat surface, but I challenge you to run it and tell me differently. Right before Mockingbird Lane and the Greenville Ave intersection was the relay race pass-off spot. Natalie was running this race as a relay with her friend, and as I approached the 7 mile marker, I was a little jealous of her because I knew this was the spot where she would be passing the baton (I mean drum stick) to her friend and she would be done with her portion of the race, leaving the finish to her relay partner. I however, had 6 more miles to go, but I was still physically feeling pretty good. I knew I was more than half way finished at this point and this was where I usually start counting down the miles and minutes to the finish. I lied to myself a little bit to work through the mental game. 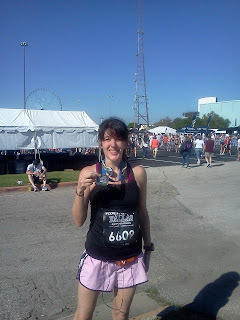 I kept saying to myself over and over, this is the easiest half marathon I have ever ran. I am stronger than ever. This is a piece of cake. These were half-truths, but the kind of things that if you keep repeating over and over, they drown out the negativity and keep you going. As I approached the last 5K of the race, I realized that some of the white lies I was telling myself were coming true. 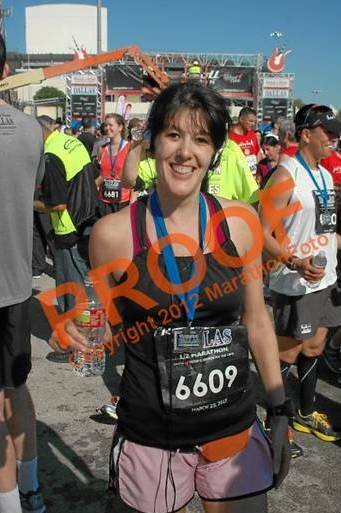 Again, I began to compare this experience to my last half marathon in Huntington Beach. The last two miles in Huntington Beach were hell. I completely ran out of steam that day, I even had to walk at the end. I thought it would never end. Each ¼ mile felt like another full mile. At the end of this race, I was still rockin’ and rollin’ (pun intended). Sure, I was tired, but I was still moving forward at my comfortable pace. I wasn’t miserable. I was definitely on track to finish strong, to accomplish my goal. I was using my music to motivate me as well. My running playlist is chalk full of uptempo songs. At the end of the race it seemed there were song lyrics on each song change that I could sing along to (in my head, I'm not a crazy person) to motivate me. Song lyrics, which have nothing to do with running a half marathon, but taken out of context, they were about my running and I was using them to push me forward. I know, some of these are a stretch, but whatever works, right? “My body tells me no, but I won’t quit, cause I want more, ‘cause I want more” – I Want More, Young the Giant. Then, as I passed back into the gates at Fair Park I knew the end was literally right around the corner. I almost couldn’t believe I still felt as strong as I did. I couldn’t see the finish line yet, because the last part of the race was rounding a corner. My Garmin already was reading 13.1, so I knew I was so close. This is the only point in the race where I really picked up the pace, giving it all I had the last 2/10th of a mile. I was so happy realizing that barring me tripping over my own two feet and falling flat on my face, (a distinct possibility) I was for-sure going to beat my previous personal record of 2:00:47 at Huntington Beach and finish this half marathon with my goal of under 2 hours! Then it happened, I crossed the finish line and hit stop on the Garmin. 1:59:23! WOW! I did it! I was on top of the world as I made my way to collect my finishing medal and scarf down some post race bananas and chocolate milk. I downed a couple of bottles of water as I waited for Natalie in the parking lot behind the race. At this point, it was downright hot. The weather was in the 80s and the sun was beating down on the asphalt parking lot with no shade to be found. The further I got away from the finish line, there was less availability of free water and I was thirsty! I stumbled to the medical tent where I begged for water and they gave me a 4 oz. bottle that I chugged before stepping back outside the tent. Jimmy John’s had a strong presence there handing out free mini sandwiches. Everywhere I turned, there was a Jimmy John’s rep yelling about free sandwiches. I couldn’t help but wish that they were giving out as much water as they were sandwiches. I would have given my right arm for a large bottle of water. And I wait some more. I exchanged a few texts with Natalie to learn that she and her relay partner had a mishap with the drumstick pass off. Her partner had some issues with getting to the relay hand off point from the start line, so she just decided to run the first leg of the race also. So, both her and her partner ran the first leg, then followed the instructions to take the Dart Bus back to the finish, which apparently was not easy or convenient and still involved a lot of walking. Cell phone service started to go south for both of us (we have different carriers) and we had some minor short-lived communication issues. I assume the towers were overloaded with all the people. The phones were working finally and she let me know she was at the car, and I started to make my way there to find her. I realized pretty quickly that I had no idea where the car was parked. I wasn’t even 100% sure that I was in the right parking lot. I realized that the last 1 ½ hours that I was sitting baking in the sun, could have been better utilized looking for the car. I was lost, tired and hot. I text Natalie my general location and she came looking for me on foot. When I heard her call my name and I saw her standing there, I ran to her with a big hug. I don’t think I was ever so happy to see anyone, ever. At least that is how it felt at the moment. I was relived to sit in the air conditioned car and drink bottled water and relax on the way home. I did it! Funny that I wasn’t able to achieve my goal until I focused on pacing myself and slowing down. For the first time, instead of focusing on going fast to get across the finish line more quickly, I focused on not going fast, and that strategy brought me across the finish line faster than I had ever before. Slow and steady does win the race, against myself at least. So, allow me to brag a bit. Although hubby says one shouldn’t brag about coming in 2349th place! HA! Then, just because the results were searchable by first and last name, I feel inclined to share with you that I came in VERY FIRST place out of women named Lea or Leah. Just sayin’, I probably should get a special medal for that.